Wow _ She’s like a sakura. The colors, hair ties, cross and soft skirt create that feeling. She would fit very well sitting under the blooming cherry trees. @Martin: Thank you for the poetic description, Martin. Gorgeous. Love the jacket with that dress. And the headphones! ＠Lily & Rokku_sakasu: I think so, too! Those masculine earphones and the feminine white dress look really well together. So cute! Just love this look. @karyn: You mean, it makes you feel at ease? I can’t help but come back and look at this photo again and again. I love the combination of masculine and feminine pieces! @shazz: Really. 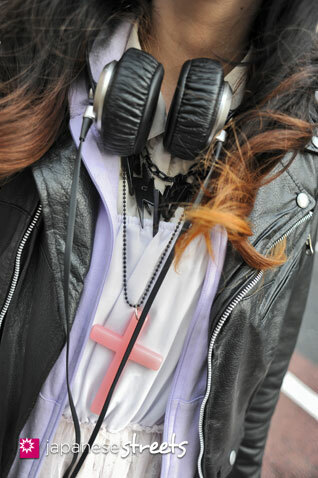 Especially when you take the materials in account that Arisa selected for her jacket and dress, leather and sheer.